GOOD FRIDAY. Early in the morning, Jesus is condemned to death by crucifixion. His disciple who betrayed him, Judas, hangs himself. At approximately 9:00 AM, Jesus is condemned. Jesus is brought to Pilate, who tries to avoid his death by using a custom to have one of two prisoners freed and the other punished. Pilate asks the people to choose between Jesus and a criminal who has committed awful crimes: Barabbas. The people of Jerusalem choose to free Barabbas and crucify Jesus. Pilate relents to the custom, although he states that he "finds no fault" in Jesus. Jesus, who has been whipped and is wearing a crown of thorns, is paraded through the streets carrying his cross. The route through which he is taken (The Via Dolorosa) leads to Golgotha, the "place of the skull," where hi is crucified at about noon. By 3:00 PM, Jesus is dead. By 6:00 PM, Jesus body is interred in a tomb in the garden of Joseph of Aramithea, who later flees Jerusalem to England to escape persecution for letting his garden be used. Well, it's five twenty on the Monday of Holy Week. By this time on that day, Jesus had already entered Jerusalem on a donkey, with palm branches being waved and people shouting "Hosanna." At the end of the parade, he was confronted by the Priests and Pharisees and Saducees who questioned his authority. He told them he would reveal the source of his authority if they would answer one question: did John's authority come from man or God. Knowing that, if they said "man," John's disciples who followed Jesus would probably kill them, and that if they said "God" it would reveal their complicity in having John killed as blasphemy and they would be killed; they chose silence. Jesus then refused to answer their question. 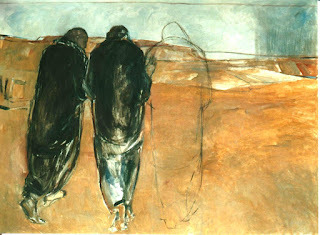 This painting shows a depiction of the Disciples walking with Jeus on the Road to Emmaus. I find it interesting the symbols in the painting...subtle reminders of The Cross, the hand resting on the invisible shoulder of Jesus, and more. They stand to remind us that God is with us, even when we do not recognize His Presence. We'll talk about that next Sunday at worship. By "speaking to me" I mean that none of them did anything special for me...none of them touched me in the way I wanted them to. There were all sorts of approaches to the day and week, but none of them made me want to stand up and say "Eureka" "I have found it." So, I've decided to approach the week from two dimensions: the historical and the theological. I'll be talking about the events and how they have shaped the teachings and practices of The Church over the last two thousand years. We may just find ourselves on a cobblestone street in an ancient city shouting "Hosanna."